Should You Follow These Web Design Trends for Your Business in 2019? What is your New Year’s resolution in this wonderful year of 2019? Well, I don’t want much for New Year’s resolution; I only want to improve my creativity, especially when I am a writer who also has eyes for design creativity. And just when I said that, I already saw a new set of creativity applied on 2019’s new web design trends. Wow, people are just fast, aren’t they? Every year comes and goes, and people already come up with ideas to improve and produce new and better inventions, especially business owners and designers. Maybe you have seen those unique eateries with modern designs, as well as their modernish food menu that are unusual. Yes, even creations can also be made for food and drinks. However, there is another thing that business owners can make use of when it comes to attracting new customers; web design. If you are a business owner, having a website is crucial in attracting and interacting with customers; therefore, knowing about web design is also necessary. Now that it’s 2019 and there are new trends already, let’s look into these web design trends in this year and find out if you should follow the trends for your business’ website. Keep reading to find out! We all know scrolling is simple. We just have to scroll up and down to go to a page that we want to reach. However, non-traditional scrolling has a different kind of…well, scrolling. Take a look at the example below. Aces, a baseball recruiting agency, uses a horizontal scroll at the top of their website to grab users’ attention, show off the talented players they work with and give some fast facts about their business. So, instead of being directed to the bottom page as we are scrolling down, we have a slideshow that moves sideways until we have seen the entire content there. When we’re done, we will be directed to the bottom page as usual. I know websites that contain gradients are not really new in the world of web design, but hey, it’s always bang on-trend from time to time. I mean, look at this example. Even Instagram rebranded their logo to the magenta gradient – and people definitely noticed the difference. Their decision to modernise gradients impacted design as a whole and has now become a popular design choice among creatives. Okay, I know scrolling has really become the trend in web design lately and scroll animations seem to be more popular. This kind of web design is not only showing the value of a visual design talent and front-end development skills, but it also increases the quality of time efficiency and user engagement. By scrolling and clicking through the page layouts, a website with this type of design can show users their entire service line or important content. Another trend that can increase value to the business branding itself is the use of colour branding. Camden Town Brewery is using a web design that is branded based on page or product and changes colour when the user navigates and interacts with the product or pages. This web design subconsciously helps the user navigate through the site and associate which product or service page they’re looking at solely based on visual colour cues. So, should you follow these trends? The answer is yes, you should. However, that doesn’t mean that you can follow all of the web design trends in 2019. 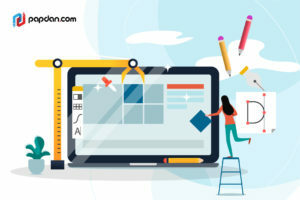 Aside from these web design trends mentioned in this article, there are other web design trends in 2019 that you also need to look at. That being said, not all design trends are made and meant for your business. You still need to see if the design is SEO-friendly or not. You also need to know if the design is compatible with any device and whether or not the design will affect your website’s performance. Therefore, you should consult to a professional web designer to help you with your business website. Haven’t got a web designer yet? Contact or visit us now and let our design team assist you and give ideas and solutions for your business website. This entry was posted in Article and tagged agency, business, content, design, designer, developer, development, google, marketing, Melbourne web designer, online, search engine, search engine optimisation, search engine optimization, SEO, SEO agency, seo services, social media, tips, web design, web designer, web developer, web developer agency, web development, website, website designer, website development on January 3, 2019 by Mario.